Thankfully July has been relatively quiet weather-wise. The snow hasn't been serious and it has been a couple of degrees up on average - long may it last! Every alert is assessed and given a severity level. As you may be aware, we have four severity levels for you to choose from. The higher your severity level, the fewer lerts you get. To change your severity level, click the link at the bottom of any recent lert. We've always sent email-only alerts for low-level incidents, but we now cover much more (e.g. recalls, scams, roads) therefore more low-level lerts now come through as email-only. 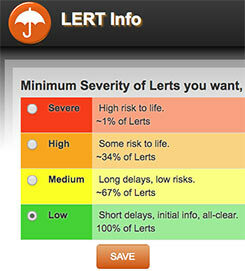 When our App is complete, ALL lerts will ultimately be sent through it - for those who have the App. Until then, we will just use Txts for more important situations to be sure lerts get through. If you find e-mail too slow, Upgrade! We are making steady progress with the App. We've decided not to fundraise and instead use a bank loan to complete the App a month earlier, with testing hopefully in September. It will be a far better product in terms of speed, accuracy and flexibility. 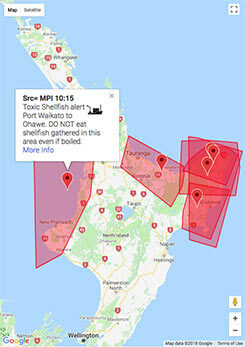 You may have experienced some features of the App already via Facebook, where we display our alerts with geofences (red areas on maps - see below). 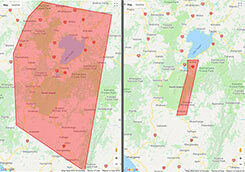 These maps help you to see ahead to where you're travelling and give you the details of the alerts. The App will eventually replace Txts at a cost of $2/month. The App will allow us to target affected areas very accurately. e.g. the Desert Rd closes for some reason. Currently, we send the lert to everyone within the large area (see below). With the App, the area is much smaller and you will ONLY get the alerts if you live in the small area, or move INTO it – where the App on your phone will notify you. This solves the issue of having of too many alerts of little interest to you. All other alerts will be treated the same way as well, so you could literally be 100m outside a targeted area and won't get an alert. Were you to walk across the boundary, your phone would be alerted. Like to see what we look like? We now appear on the "About Us" page.